Turn your fixed cordset into a detachable one! 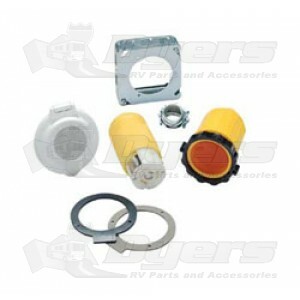 Includes power inlet, female connector, and weatherproof cover. The 50 Amp ParkPower Detachable Power Conversion Kit is a great way to upgrade your existing hard-wired RV power cord to a convenient detachable power cord system. It includes all hardware required to complete most installations. Keep your existing power cord. Converts 50A hard wired RV power hook-up to detachable power hook-up.